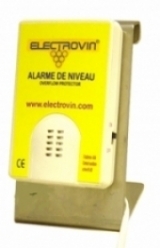 The VINALARM is an alarm level with electronic detection. It is the perfect tool for filling or emptying a tank without any overflow (or without pumping the bottom of the tank). This level alarm could be used in filling or emptying. Price : 405.00 € VAT Excl. Economic version of the VINALARM. Price : 79.00 € VAT Excl.